Our Minted Peas with Lemon and Shallots are an easy bright side dish, that pack a ton of flavor! And come together in a snap. They go terrifically with fish, lamb, chicken, and beef alike. Here we served them with Wild Alaskan Salmon en Croute. 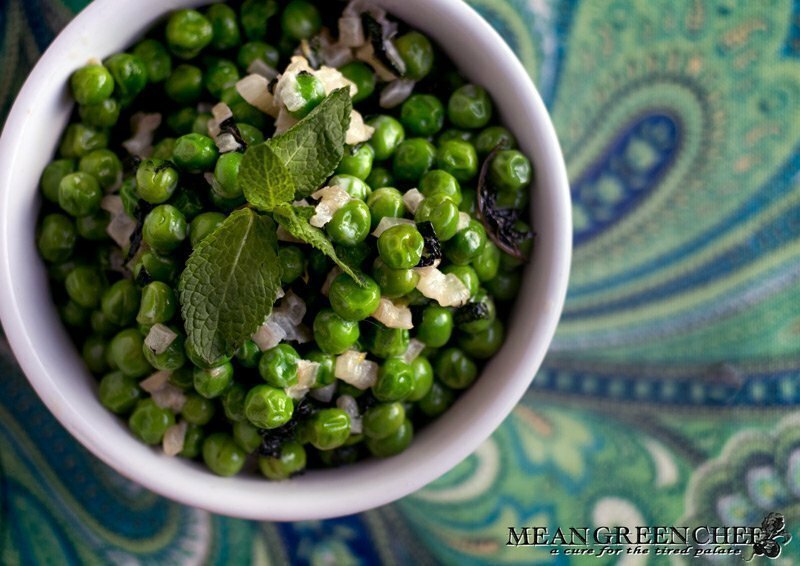 The fresh mint and lemon highlights the flavor of the peas and makes them shine. English peas, also known as shell peas and garden peas, have a small window of availability popping up in gardens and markets in late Spring and early Summer. Shining especially bright in the month of May when they reach their zenith. In the off season, don’t hesitate to purchase frozen peas. They’re the best alternative when fresh aren’t available. Fresh peas: Fill a large heavy-bottomed saucepan half full with water and 2 tsp Kosher sea salt and bring to a boil. Drop the peas into the boiling water and cook until al dente, 2-3 minutes. Start your timer immediately and drain into a fine-meshed strainer once done. Pour out onto paper towels to drain. Frozen peas: Put them into a fine-meshed strainer and run under cold water for a couple of minutes until they are almost thawed. Pour out onto paper towels to drain. Our Minted Peas with Lemon and Shallots are an easy bright side dish, that pack a ton of flavor! And come together in a snap. They go terrifically with fish, lamb, chicken, and beef alike. Prepare the peas, see instructions above for fresh and frozen. Melt the butter in the heavy-bottomed saucepan over medium-low heat. Add the finely diced shallots and sauté until softened, about 3 minutes. Combine the cream, half of the mint, lemon zest, dash of Kosher sea salt, and freshly cracked black pepper into the softened shallots. Bring the mixture to a bubble and cook stirring with a flat-bottomed wooden spoon until it begins to thicken about 2 minutes. Add the peas and stir until they're warmed through and coated with sauce about 1 minute. Remove from the heat, taste and season with additional salt and pepper if needed. Garnish with mint and serve. Be sure to check out our Wild Alaskan Salmon en Croute, perfect for an intimate dinner for 2 or a dinner party for 8! Be sure to check out our other side dish ideas! Did you make a mean Green Chef Recipe Recipe?